Prime contractor having a State or Federal contract. Then click here for Instructions on how to begin! Think of it as a FREE opportunity pipeline for your business. The Network consolidates many resources into one convenient system that lets you: search for new contracts, market your business to visitors to Vermont, list your products and services and find vendors and suppliers. Post and view bids, see awarded contracts and if you're a Vermont company, sign up for automatic notification bid notices. Vermont Bids -- A searchable database of state, federal, municipal and private sector open and awarded contracts. 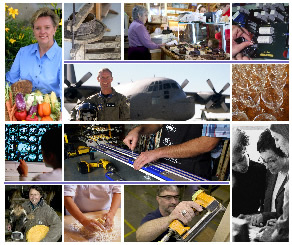 Federal Bids - Receive notice of federal contracting opportunities courtesy of our Vermont Procurement Technical Assistance Center. A comprehensive website of Travel and Tourism businesses that lists places to stay and eat, and things to do and see. By registering your Vermont business in the Vermont Business Registry you can promote your business through the Vermont Travel Planner website. The Vermont Business Registry is an online searchable database of many Vermont businesses. The searching capabilities allow you to locate vendors and suppliers. You can also add your Vermont business so others can find you. Looking for comprehensive info on everything and anything relating to business in Vermont? Start at thinkvermont.com. Tap into valuable marketing programs for tourism businesses at VermontPartners.org. A listing of business assistance seminars, training workshops, trade shows, etc., that are sponsored by various organizations.